Remembering Aurelia "Skeeter" Speidel | Remembering Aurelia "Skeeter" Speidel | De Soto Obituary Search | Dietrich-Mothershead Funeral Home, Inc. Remembering Aurelia "Skeeter" Speidel | De Soto Obituary Search | Dietrich-Mothershead Funeral Home, Inc.
Aurelia “Skeeter” Speidel was born in De Soto on July 31, 1927 a daughter to Joseph and Elizabeth (nee Schrameyer) Koch. 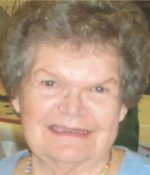 She died on July 15, 2016 at Delmar Gardens-West, in St. Louis County at the age of 88. 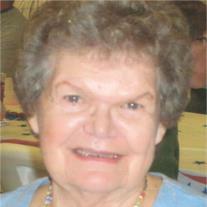 She is survived by four children: Mark (June) Speidel, Festus, Barbara Murray, St. Peters, Linda (John) Schweppe, Ballwin, and Julie (Bob) Bruff, De Soto; ten grandchildren, several great-grandchildren; and two brothers: Herman “Dutch” (Rose Mary) Koch, De Soto, and Charles (Dorothy) Koch, De Soto. She is prceded in death by her parents; her husband: Earl Speidel; a daughter: Karen Speidel; a son-in-law: Tom Murray; a sister: Mildred Henley and her husband Fred Henley. She was a member of AmVets Post #48 Auxiliary and Daughters of Isabella Circle #659. As an expression of sympathy memorial donations may be to the American Parkinson Disease Association, 1415 Elbridge Payne Road, Suite 150, Chesterfield, MO 63017, info@stlapda.org . Deacon Ed Boyer will officiate the service.